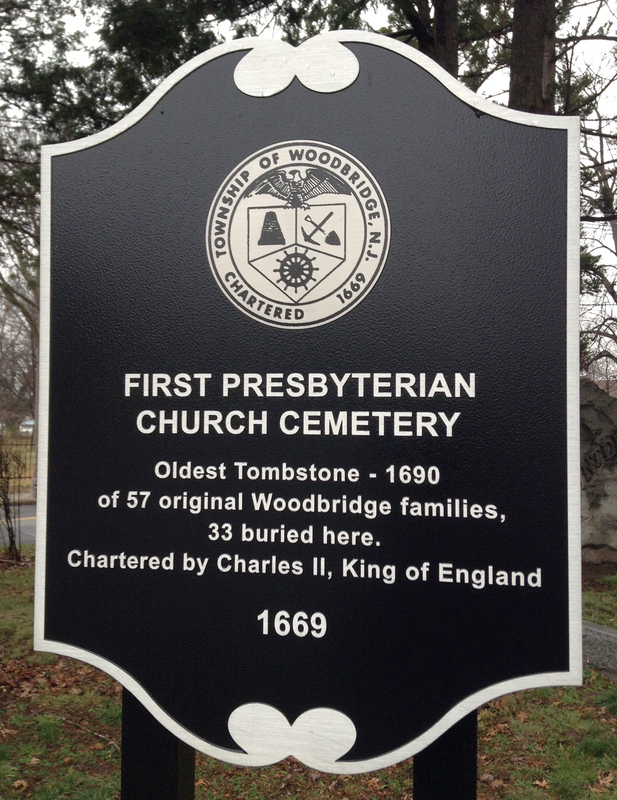 The historical colonial cemetery of the First Presbyterian Church of Woodbridge lies adjacent to the church on a 5-acre site. The cemetery is beautifully maintained and has probably been used as a burial ground since the Town Meeting House was built in 1675 on the exact same site as the present church. The earliest tombstone is dated 1690 and in all probability there were earlier ones which deteriorated and disappeared. The 1690 monument is the second oldest in Middlesex County. The type of monuments found are typical of colonial cemeteries. The earliest types were made of sandstone, also called brownstone, which did not hold up. In the early 1800's monuments began to be made of white limestone. The limestone also had its problems with the inscriptions becoming obliterated after a number of years. In the late 1800`s, the granite stone monument came into use and is still being used today. Amazingly, there are some brownstones that are 250 years old and are still in mint condition. 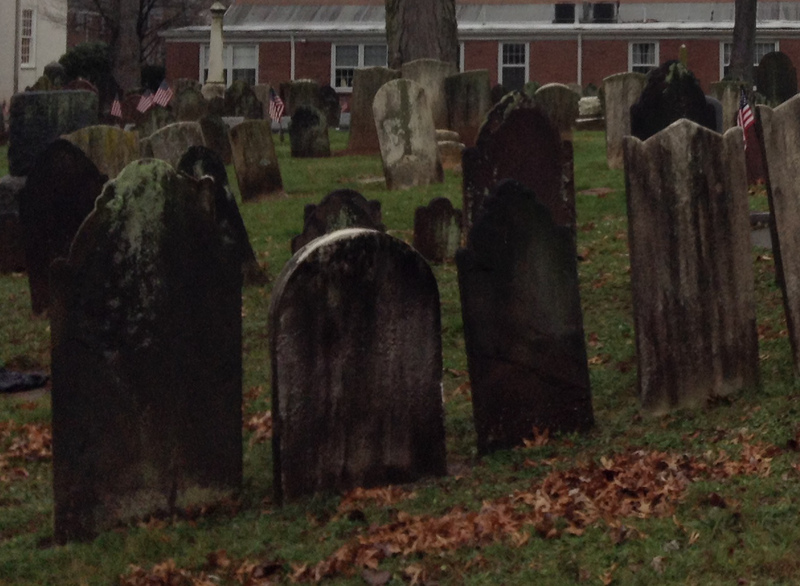 The oldest brownstone in the cemetery in good condition is dated 1702. 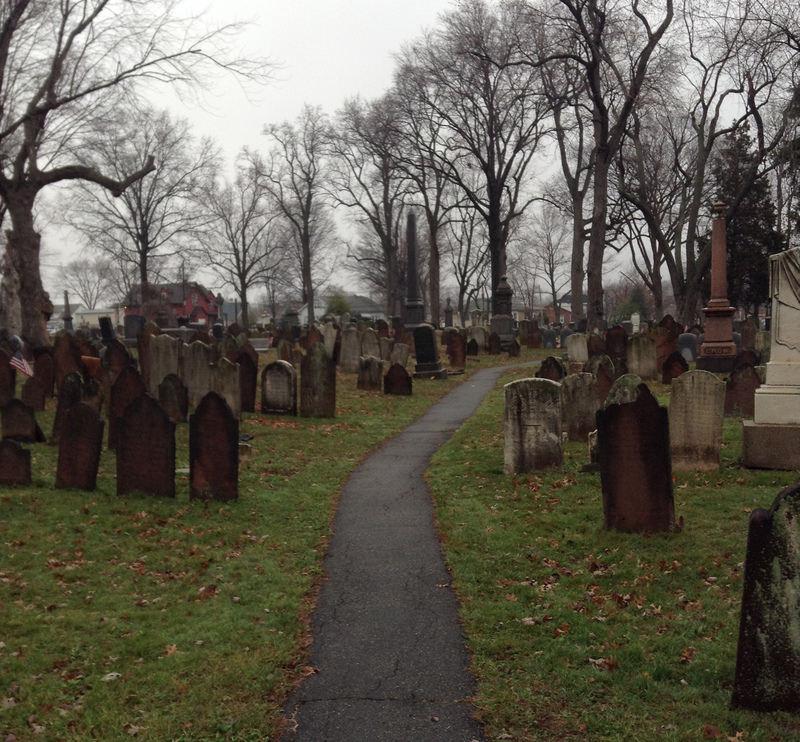 In addition there are a few fieldstones, slate and terra-cotta tombstones. There are burials of the earliest settlers of Woodbridge: the Freemans, Cutters, Pikes, Bloomfields, Barrons, Edgars, Ayers, Moores, Pralls, Inselees and Harneds. The church continually receives requests for genealogy information on these old families. 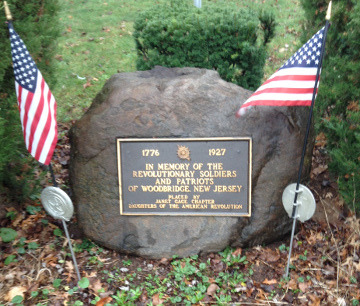 The first settlers of Woodbridge were Puritans and there is a wide variety of brownstones that have what is known as Puritan Funerary Art inscriptions on the headstones. The artwork consists of carvings on the top of the monument which can vary from a grotesque "Death's Head" to a more cherubic face known as a "glorified soul image having wings." The cemetery is noted for having many variations of this type of artwork. Two monuments are unusual in that they have the carved death head skull above crossed bones. 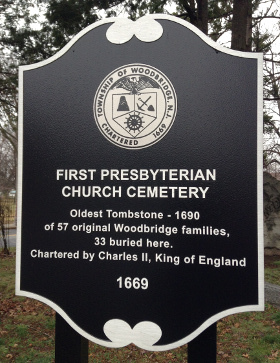 Many individuals who were involved in the early history of Woodbridge and New Jersey are buried here. One famous person is General Nathaniel Heard who led the Middlesex County Militia to Perth Amboy in 1775 and arrested William Franklin, the Royal Governor of New Jersey. An ancient yet clearly readable headstone in the cemetery marks the burial place of Mary Compton Campbell, the first baby of european descent born in Woodbridge, daughter of William and Mary Compton and the wife of Caleb Campbell. Mary, born in 1668, died in 1735 at the age of 67. 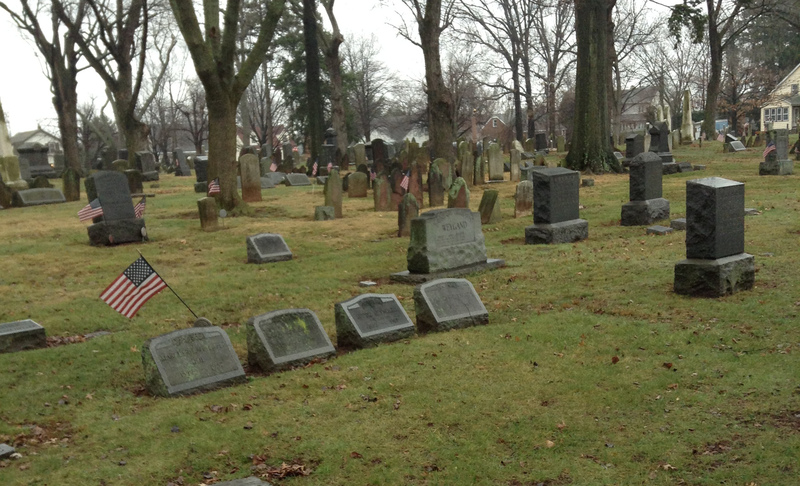 The cemetery has burials of approximately 75 Revolutionary War soldiers, 50 Civil War soldiers and veterans of WW-I, WW-II, and other conflicts. It has a continuously patriotic appearance because every year a new flag is placed on each veteran's grave - approximately 240 flags in all. There are many other interesting grave sites. An ornate monument to a slave was recently replaced by a new monument. Graves of five ministers of the church; two town mayors; Thomas Barron, who donated the money for the Barron Art Center; and many others can be found here. A walking tour is available and church personnel will aid in this tour. 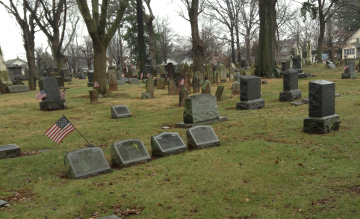 In December 2007, the church and cemetery were placed on the National Register of Historic Places, as well as, the New Jersey Register for the same. The applications for such action were made by the Heritage Committee of the church, then headed by the late Robert J. McEwen, who was chairman at the time. His enthusiasm, persistence, and wealth of knowledge inspired the committee and others of the congregation to press forward for this action to be completed. It is hoped that this important step will increase the preservation of this spot as new generations worship and serve the community as members of the Old White Church. We are grateful to those who went before us, building and reflecting the Christian heritage which is its foundation.